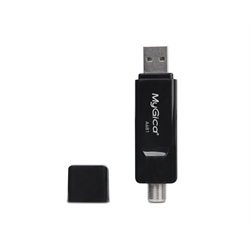 The USB-A681 HDTV USB Tuner Stick from MyGica allows you to watch and record live OTA digital TV on your PC, laptop. It's also a great addition to the MyGica ATV495PROHDR Android TV Box. Time Shift lets you also pause whatever you are watching to resume without missing a single minute. It also comes with an EPG (Electronic Program Guide) and Teletext. In addition to streaming video, the Tuner Stick also lets you listen to ATSC digital radio. You can also save your favourite stations to get back to them quickly and conveniently. The Tuner stick is about the size of a pen and connects using a 2.0 USB port. The package includes an ATSC Mini USB stick, a remote control, a USB cable, a quick installation guide, antenna and CDROM with driver application software and PDF manual. ** We strongly recommend using an wall mounted, or better yet an attic or roof mounted Antenna to receive the maximum amount of channels in your area. OTA availability is best in or near major urban cities. Please check online for OTA availability in your area before purchasing. NOTE: The MyGica USB-A681 Tuner Stick doesn’t work on Mac PC and laptops.